Can't wait to start coloring! I want to participate in your contest!! This is so cool for you to do this for us Dede! 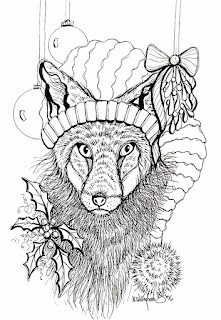 I am going to color the Santa fox, but may not be very realistic, lol. Thank you Dede ! He is just adorables ! We need a Willingham Coloring book !!! Merry Christmas & Happy New Year ! Hopefully I can make the stream !!! I am partcipating.And invited my friends to as well.Love ya Dede.Thanks. Thank you Dede for the page, Him's soooo cute!! give-a-way ! ! Happy New Year ! ! I am giving the fox a coloring! Thank you Dede for the cute xmas fox, love that you share your talent, its a beautiful piece of art. HI Dede, I found you on you-tube about 6 months ago and am new to collage and color books. I do paint in watercolors, which are so much fun to do in color books. I love your mixed media art and imagination. Thank you for sharing the xmas fox. I can't wait to watch the you-tube video of the sketch. Merry Christmas and blessings to you and your family! Dede thanks for sharing the Christmas fox and all your Knowledge on streams. I'm going to attempt to color the fox, wish me luck! Hi Dede! Thanks so much for giving us the opportunity to color one of your amazing drawings. 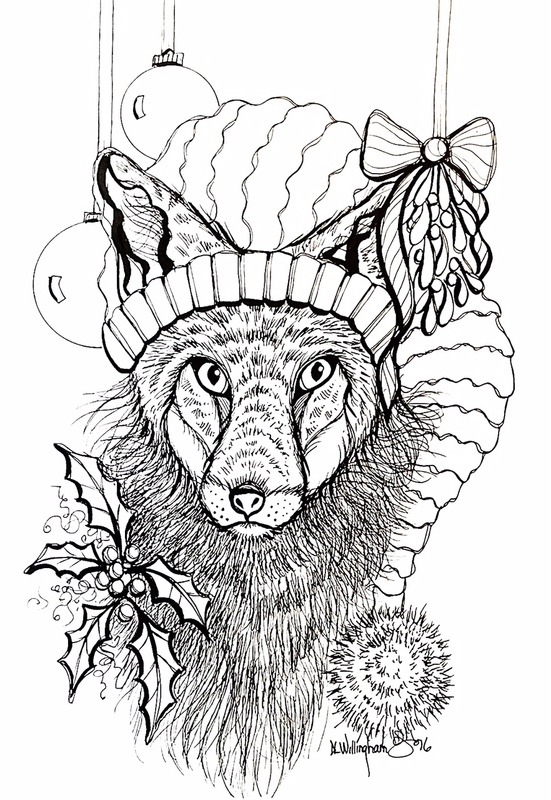 I am working on coloring your Christmas Fox. Wishing you a very Merry Christmas and a Happy and Healthy New Year! I am TarheelTeresa on Ustream. YHey Dede i love the drawing! So excited for New Year's Eve. I had fun colouring Mr. fox! Had to delete first comment due to typo - I know you are shocked. Lol. YAY for Sassy and I - we BOTH colored and I even finished~! Woo hoo Wee Heanie! My fox ended up a little "wolfie" - his fur wouldn't stop growing! thanks, colored and posted, sanpatzke on ustream. Thanks so much for the great Foxy Santa. So nice to have a Dede original to play with. Thanks for all that you do and teach us! This is Marie LaVeee. I posted before but I do not see it here. I colored your Christmas Fox. i colored the fox. thanks for the pic. first time trying washes....i'm hooked. Yippee!!! Thank you so much. Off to email you now!